The Eurekahedge North American Hedge Fund Index was up 13.33%1 during 2010 as the region’s hedge funds maintained their winning run. North American managers had posted record returns in 2009, and although 2010 was marked by high volatility and sudden swings in the markets, the funds continued to deliver consistent returns throughout the year. This was the third consecutive year that the region’s hedge funds outperformed those in other developed markets. Managers also attracted significant capital from investors in 2010, gaining US$60.4 billion in net positive asset flows – accounting for most of the US$70.6 billion allocated within the global industry during 2010. The total size of the sector now stands at US$1.08 trillion2, managed by 4,576 hedge funds. These numbers represent a significant rally after the industry suffered massive redemptions and significant performance-based losses during 2008 and early 2009, when assets under management fell to US$849.2 billion. Excellent performance-based gains and positive net flows in the last three quarters of 2009 set the stage for the consolidation witnessed in 2010. 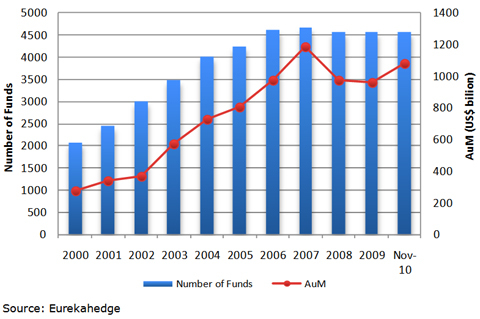 Figure 1 shows the growth in the number of hedge funds and the assets under management in North American hedge funds since 2000. From here on in, this report shall focus on data up collected up to the end of November 2010. 1 Based on 58.32% of funds which have reported December 2010 returns as of 14 January 2011. 2 Not including December data.